Last week my sister and I watched Beauty and the Beast (2014), which is a French production of the classic story we all know and love thanks to Disney. I didn't know much about this adaptation going in except that I had seen several of the costumes on Pinterest and I was interested to see it since the new Disney live action version is coming out soon (which I have been less than thrilled by costume wise from what we have seen in trailers so far). The story appears to be set in the 1810's through the 1820's and is set in a strongly historically based but still fantasy world. It's is about a once wealthy family that has now appears to have lost all of their money on a ship that sunk in the middle of the ocean which forces them to move out of their high society house in the city to a plain country cottage. Bell's father discovers the Beast's castle on his way home from the local tavern and on his way out he picks a rose. The beast attacks him then and basically tells him that in exchange for the rose he demands a life. He goes home and Belle decides that since she is the outcast of the family/has no future she should go. So she goes and becomes the beasts prisoner. He provides her with a new dress every day and he has a very strict schedule of when to eat so she can't run off (or something like that). She has no interest in him and actually fears him. Oh, and there's a pool of magical water in her bedroom that heals wounds. Fun right? At night Belle has dreams (thanks to the magically water it seems) of her running up to a mirror/portal thing which shows her the beasts past. He was practically Gaston in all but name (actually, I don't know what his name was in the film so maybe he was Gaston) and had a beautiful wife/girlfriend/fiance/I don't really know what because they never said. But they were in love. Eventually, Belle makes a deal with Beastie that she can have one last day with her family in exchange for a dance. He accepts, they dance (this was probably my favorite scene in the whole film), he asks if she could ever love him, she screams in his face, he leaves. Er, it happened sort of like that anyways. Point is, she got to go back home to her family, stuff happens, and she returns in time to save Beastie, who has just been shot. She and her brothers (they're so useful!) carry him into the magical water in her bedroom where he transforms back into human form because Belle somehow changed her mind and admitted that she loved him. I have no idea at what point she turned from hating him to loving him, but there you go. Anyways, that's my "brief" synopsis. A lot happened in this film considering how slow it felt. My overall thoughts are that this film is visually stunning, but story wise, it moves rather slow and was really confusing. But every shot in the film looked like it came out of a magazine. I mean, just look at this! Now, onto the actual point of this post, the costumes.I'm just going to be reviewing Belle's dresses because they were the main event costume wise and this post is going to be long enough with just her dresses. 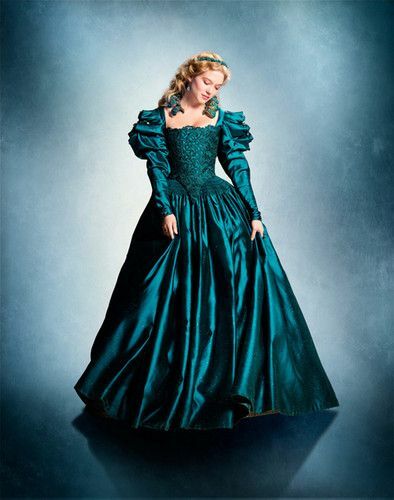 The costumes for this film were designed by Costume Designer Pierre-Yves Gayraud. All of the costumes that Belle wears have a heavy Tudor influence, which I love, while the costumes of Belle's sisters and the rest of her family seem to be inspired more by the 1810's-1820's. 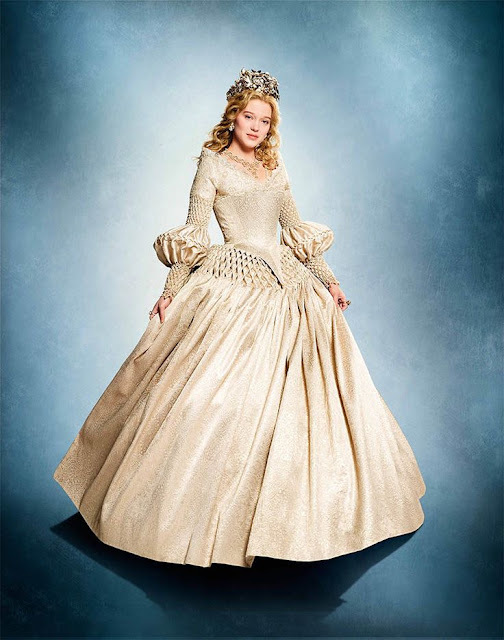 Belle's first ballgown she get's from Beastie is this cream silk/brocade gown. While it's definitly a work of art, I really didn't care for it. The sleeves are kinda weird, fabulous but weird, the skirt gathering looks like honeycomb to me and the neckline looks strange with the structure of the bodice of the lower half. I was glad that this one only got a little bit of screen time. But I really do like the fabric choice and her crown. 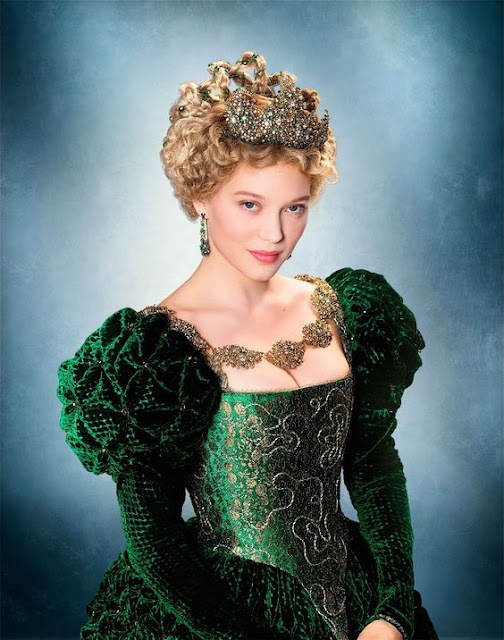 Next, is her emerald green, quilted velvet gown. Just look at it. It's stunning, isn't it? I love the Tudor influences on the bodice and the jewels, but my favorite part of this dress (besides the color) are the sleeves. Aren't they beautiful? Also, her hair fascinates me. I'm so glad they actually did something with her hair in this film because too many movies have their historical/fantasy fashions with the hair down in modern curls, which completely ruins the look and takes you out of the setting. I appreciate that they were able to do something kind of wacky, but subtle. It's enough to realize that this is a fantasy world while not drawing to much attention to it. This next dress is my favorite. It's an aqua blue silk dress with these wonderful fluffy sleeves and the bodice is covered in a lace cutout in a matching color. I love the accessories on this costume: the collar and matching headband. I think my favorite part of this dress though is the color. Now, I have to say that this next dress has me really impressed with the color. If you've ever tired to photograph something red, they know that it's really, really hard to do. 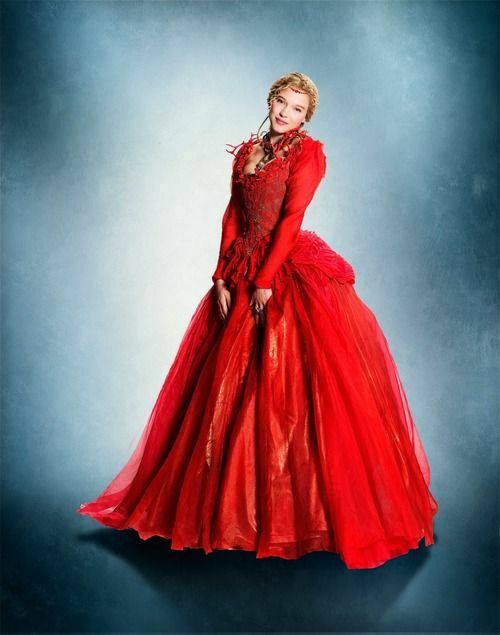 But somehow they managed to make a giant red dress and still film it. I am thoroughly impressed. 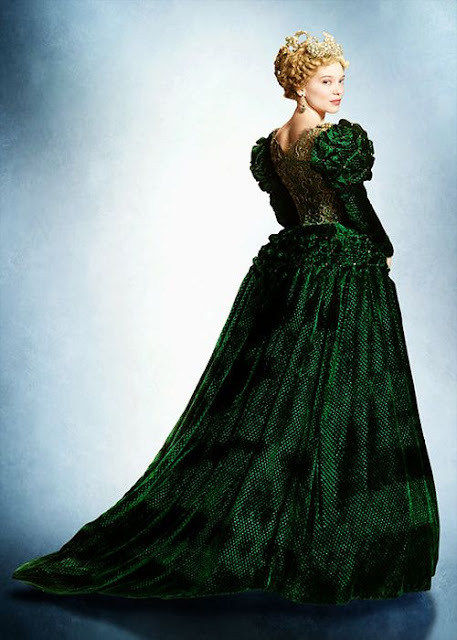 As for the design of the dress itself, this one was the last dress she wears in the movie and during the climax of the film. My sister really loved it, but I liked her earlier two dresses better. The only real reason for this is because I like softer colors and the bright red was a bit harsh, but design wise I really liked it. The skirt has a flowy top layer of what looks like chiffon, and the sleeves are relatively simple compared to her previous dresses. As for that giant necklace, I'm not a big fan. I feel like it's too big and weighs her down, especially with her hair in the pulled back style that it is in. If feels a bit out of balance. My rating for this film as a whole is only 3 out of 5 stars, but for costumes I give it 4.5 and a full 5 stars to the art department. I love how the costume designer was able to create costumes that fit into a completely fantasy world but still manage to ground the costumes with familiar shapes and designs from history. Have you seen this version of Beauty and the Beast? 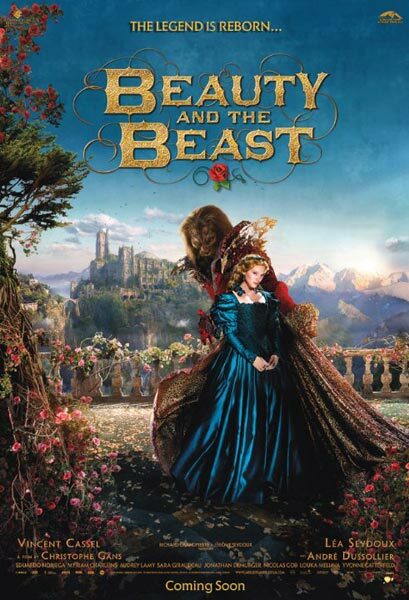 What's your favorite adaptation of Beauty and the Beast?